Trish is under a lot of stress and attributes some of her recent absentmindedness to that stress. But when her mother suddenly passes away it appears that Trish may have mixed up her medication by mistake. Detective Colin Flynn is handling the case and at first it appears that Trish's mother's death is just a terrible accident. Trish is still having memory lapses and is thankful for her mother's accountant Matt who manages her mother's charity. Trish's mother would have liked nothing better than for Trish and Matt to get together. But there is no chemistry between the two of them and when Matt's behavior changes after her mother's passing, Trish becomes suspicious and enlists Colin to look into Matt's background. What at first appears to be a squeaky clean background soon turns up some pretty shady dealings that could put Trish at risk. Will Colin be able to find out all he needs to know before Matt's past catches up with him? Wow! 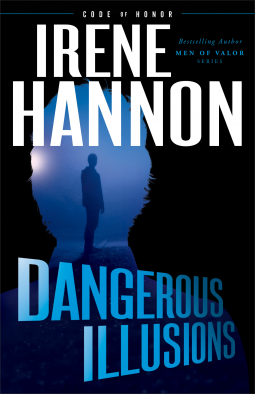 Dangerous Illusions had some amazing twists and turns and kept me turning the pages until the end! It was filled with suspense and deception and a bit of romance, the perfect trio of things I love in a story. Just when I thought I had everything figured out I'd turn the page and another twist would present itself! Dangerous Illusions will keep you awake into the early hours even when you tell yourself, "Just one more chapter." But you still have to continue on to find out what happens next. I can't wait for the next books in the series because I really enjoyed Colin's friends and look forward to reading their stories.